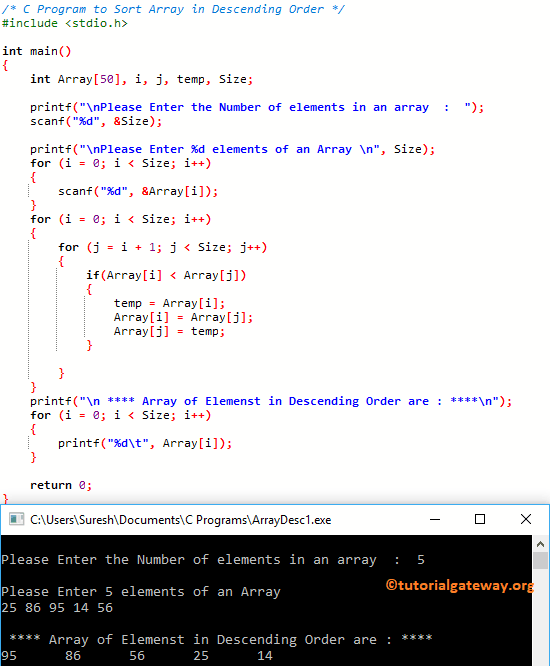 In this article, we will show you, How to write a C Program to Sort Array in Descending Order using For Loop, and Functions with example. Now the array will be 86 25 95 14 56. Next, j will be increment by 1. Now the array will be 95 25 86 14 56. Next, j will be increment by 1.
if(95 < 14) – It means, Condition is False so, it will exit from the If block, and j value will be incremented by 1.
if(95 < 56) – It means, Condition is False so, it will exit from the If block, and j value will be incremented by 1. Now the array will be 95 86 25 14 56. Next, j will be increment by 1.
if(86 < 14) – It means, Condition is False so, it will exit from the If block, and the Second For Loop. This program is same as the first example, but we separated the logic to sort array elements in descending order using Functions.